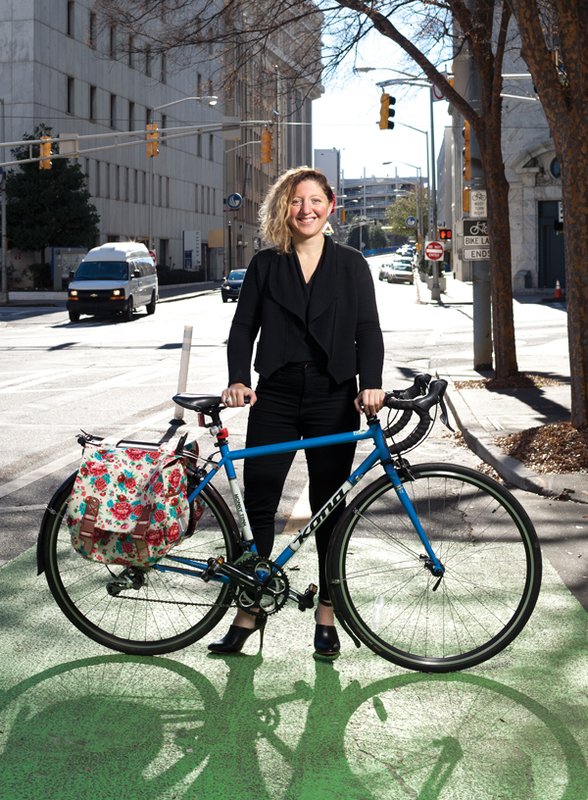 Becky Katz wants to make Atlanta more bicycle-friendly. She’s in for an uphill climb. Becky Katz’s 2.6-mile commute from her house in Adair Park to her office in City Hall takes about 20 minutes. Her mode of transit—a $1,000 Kona Honky Tonk bicycle—is determined, by and large, by her occupation. As Atlanta’s first-ever “chief bicycle officer,” her job is a mix of public relations (spreading the gospel of bicycling in a city of agnostics), politics (cutting through red tape to boost ridership), and planning (expanding the city’s anemic network of bike lanes). On a gray autumn morning, Katz begins to pedal north toward downtown. Atlanta looks far different from behind a set of handlebars than from behind a steering wheel. For one thing, it’s a lot more dangerous: A driver is encased in a ton or two of steel; Katz is protected by nothing but a Giro helmet. One day last February, a driver traveling 35 miles an hour rear-ended Katz near Castleberry Hill, totaling her bike and sending her to Grady Memorial Hospital for a broken shoulder socket and wrist. Danger can also come from below. Along the route to work, Katz swerves around a grate in the street whose bars run parallel to the curb—not perpendicular, as they should. If her tire got stuck between the bars, she’d likely go flying over the front of her bike. Katz is one of 4,064 metro Atlantans who, according to census data, identify as daily bicycle commuters—this in a region with 2.6 million total commuters. Unsurprisingly, Atlanta lags behind cities like Portland, which has 10 times Atlanta’s percentage of bicycle commuters, or New York, home to Citi Bike, a bike share program with 6,000 cycles that plans to double in size. But times are changing. Bicyclists, by necessity, are not shrinking violets. (Ever accidentally cut one off and seen their reaction?) And, just as they claim their space on the streets, they’ve also been demanding more attention from policymakers. In 2008 city officials approved Connect Atlanta, a plan that calls for the creation, by 2030, of a 200-mile grid of bike lanes that extends from the city center to most of its borders. This would make it possible to pedal from Phipps Plaza to Greenbriar Mall on nothing but dedicated bike lanes. On state roads passing through the city, additional projects have materialized: A once-perilous corridor of Ponce de Leon Avenue is safer with bike lanes installed on the shoulder from Ponce City Market to Juniper Street. And, of course, there’s also the Atlanta BeltLine, more than three miles of which is complete. As of December, the city now has 84 miles of bike infrastructure (bike lanes, trails, etc.). By comparison, there are 1,584 miles of paved streets within the city. Enter Katz, a Bronx native who moved to Atlanta in 2011 when she was 25. She learned the city on two wheels. Volunteer shifts with Park Pride led to a full-time job as a project manager, where she worked with communities seeking to improve their parks. 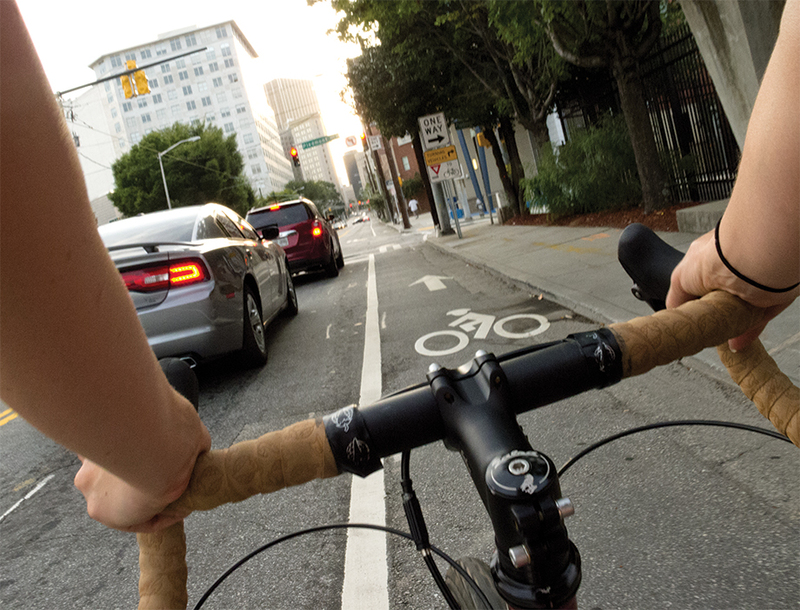 The Reed administration wants Atlanta to earn the League of American Bicyclists’ top designation as a “Bicycle Friendly Community,” which is based on the quality of a city’s enforcement of laws, advocacy efforts, and bike infrastructure. To do so, Katz will solicit public input for an update to the Connect Atlanta plan. She’ll also ensure that projects that have already secured funding—like the plan to remove DeKalb Avenue’s “suicide lane” and install one for bikes—don’t fall by the wayside. Then there’s the anticipated launch this year of Atlanta Bike Share, a membership-based program that will provide 500 rentable bikes at more than 50 stations in neighborhoods like Buckhead, Midtown, and West End. If motorists can be reasoned with instead of reviled, she says, they might be more willing to see bike lanes as a plus—and not just something that slows down their travels. She points to Ponce as an example: After planners reduced the eastside avenue from six car lanes to four in December 2013, installing a dedicated turn lane in the middle and striped bike lanes on the shoulders, the number of vehicles traveling the road each day actually rose by 4,000. Yet the street became safer: Crashes dropped by 25 percent the next year. Duplicating that success will be easier said than done. A similar proposal for a 1.4-mile stretch of Peachtree Road was scrapped after more than 1,400 Buckhead residents and business leaders objected to the plan.